Thrush is an infection of the mouth that’s caused by an overabundance of a particular type of mouth fungus. This fungus, called candida, occurs in your mouth naturally. However, when you get too much of it, you’re at risk of developing the symptoms of thrush. You can decrease your risk of developing thrush by having good oral hygiene and visiting your dentist once or twice a year. Thrush is not an overly complicated type of mouth infection, but learning more about it can help you understand the risk factors and warning signs. The symptoms of thrush are usually very unpleasant to deal with. Thrush is characterized by painful, white mouth lesions and may be found inside your cheeks, on your tongue, and on the roof of your mouth. These lesions will break open and bleed when irritated. Even a slight scrape from your toothbrush can cause bleeding. Who is at risk of developing thrush? It’s important to remember that anyone can develop thrush, but there are risk factors. People who have weakened immune systems or who are very young or very old have a higher risk of developing thrush. Certain disorders, such as HIV, or drugs, including chemotherapy, may weaken your immune system. If you have diabetes, smoke, are taking antibiotics, are taking steroids, have dry mouth, are pregnant, or wear ill-fitting dentures, you’re also at risk. A medical professional will generally diagnose thrush through a mouth exam. A throat culture or X-ray may also be used to confirm the diagnosis. Treatment will mainly involve taking prescription antifungal medication for up to two weeks. This medication can be taken as an oral pill, a syrup, a mouthwash, or a lozenge, depending on your preference and what the medical professional recommends. What should you do if you have symptoms of thrush? The symptoms of thrush are painful and can make eating, swallowing, and talking difficult. Ignoring the infection can also cause it to spread and become much more serious. For these reasons, you should seek medical attention at the first signs of thrush. Get prompt, personal medical attention for thrush and other non-life-threatening medical issues at your local FastMed Urgent Care clinic. Find the clinic nearest location by using our online locator tool. 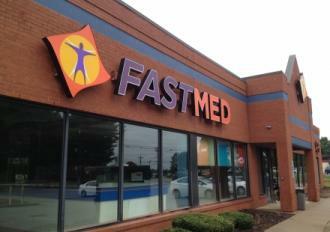 Join the conversation on Twitter to learn more about FastMed.